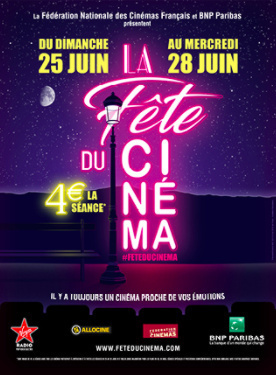 Two weeks ago we celebrated music and last week it was the movies turn with la fête du cinéma. It lasted for four days from Sunday to Wednesday and the idea is to promote cinema and theaters. When I was a teenager, I remember spending the weekend going to the cinema with my friends. We would go to different theaters in Paris and we would watch one film after another. We only paid 10 francs which is a bit more than 1 Euro to watch a film. This year the ticket was 4 Euros. It is a comedy which made me laugh and cry. The French actress Karin Viard is moving as she plays a fifty years old woman who finds out she is pregnant! Comprising the four generations under her roof is her eccentric elderly mother Mamilette and her daughter Arielle along with Arielle’s pesky Canadian partner Toussaint and their 6-year-old daughter Zoé. Finishing off the family tree is Nicole’s husband Jean-Pierre, an unemployed ex-gymnast. This film is about a family and is about family in general. I thoroughly enjoyed it! It is another comedy with Karin Viard and also with music starring French superstar, Louane Emera. The film follows a young woman, raised by deaf parents, who dreams of being a singer. I mentioned this film in the previous newsletter as it features the beautiful song Je vole. This film is based on the true story of the father of the musician Kamini. In 1975, Seyolo Zantoko, a graduate doctor from Kinshasa, grabs the opportunity of becoming a country doctor in a small French village. When they arrive in Marly-Gomont, Seyolo and his family quickly become disillusioned. The village inhabitants are afraid; this is the first time they’ve ever seen African people. But Seyolo is determined to suceed and will do everything he can to win the villagers’ trust. It is a story of determination, hard work and success, I loved it! It is a biopic about the life of French singer, songwriter and entertainer Claude François. Cloclo is referring to François’ nickname. The song My Way popularized by Frank Sinatra, was originally co-written, co-composed and performed as Comme d’habitude by François. The film follows the life of the singer from his childhood in Egypt to his accidental death in 1978. Nowadays, if you happen to be invited to a French party or if you go to a nightclub in France, you will for sure dance on one of Cloclo’s songs! it is an old movie which was my favorite when I was a little girl. 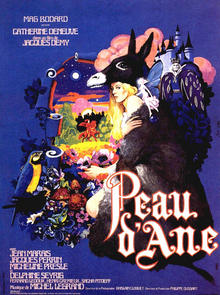 I jut wished I had all the dresses Peau d’Ane had! It is a French musical film based on the fairy tale by Charles Perrault about a king who wishes to marry his daughter. Numerous elements in the film refer to Jean Cocteau‘s 1946 fairy tale film Beauty and the Beast: the casting of Jean Marais, the use of live actors to portray human statues in the castles, and the use of simple special effects such as slow motion and reverse motion. It is kitsch but it is magical too and I am not ashamed to say that I know some of the songs by heart! Watch me telling the tale to a one of my French learner. He had only started to learn French with me a year ago but he understood everything I told him! You can read about his success story here. P.P.S. I am off travelling to Spain and to France so I will be back with new videos on YouTube in August!